The Latin text of Books I and II of Horace's Odes is included along with notes for each word. The notes give complete grammatical, syntactical, mythological, geographical, historical, and vocabulary information. A literal translation of each ode is included at the back of the book. 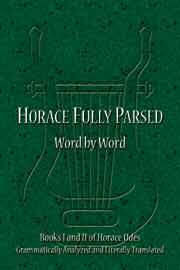 Compiled and edited by LeaAnn A. Osburn, Horace Fully Parsed: Word By Word is a scholarly text that presents the classical Latin text of Books One and Two of Horace's Odes, complete with grammatical and syntactical notes for each word, explanations for historical, mythological, and geographical references, literal translations, and more. A welcome addition to personal and academic Latin Studies collections in general, Horace Fully Parsed is an invaluable reference for every teacher and student of Horace's enduring work.